Self catering apartment with fantastic views over the sea. Strumhor is a new apartment on the shores of Loch Etive and overlooking the Falls of Lora. Adjoins our house but is totally self-contained. 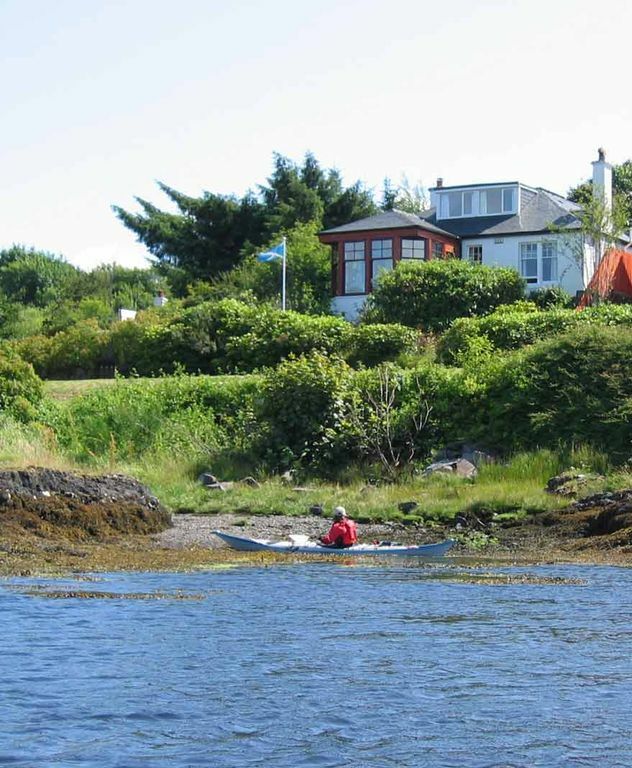 Perfect location to explore Argyll and reach the mountains and sea, or simply to chill out. Stunning views. Contemporary décor. Ideal for two but there is also a sofa bed . Bathroom and separate shower room. Free wifi and electricity. Lounge/diner and adjoining kitchen. Decking outside with small table chairs, with views over the sea. We had a lovely holiday in Connel Bridge, Argyll. The apartment is compact and beautifully presented - newly furnished and decorated. We were quite lucky with the weather - more sun than rain but even in cold weather we would have been very comfortable as the heating was very efficient. The kitchen/dining area has all the equipment and and utensils needed for self catering. We enjoyed the luxury of two bathrooms (one with bath and shower, one with shower). The heated towel rails were on all the time so there was no problem with damp towels. The position of the apartment is wonderful with views across Loch Etive and the ever changing ebb and flow of the waters. There is a pleasant pub which does meals a short walk away; also a well stocked post office and shop with fresh bread and homemade scones, nearby. In Oban, six miles away is a good sized Tesco, Lidl and Aldi. There is so much fantastic scenery in the area. A trip to Mull (pre - book the ferry) is a definite recommendation. If you go to Tobermory, try the Tobermory bakery for delicious cakes. Another scenic trip is down the coast from Oban to Seil Island (only just an island, you cross a bridge to get to it) and then a two minute motor boat ferry to Easdale Island; then have a crab or smoked salmon salad at the Puffer Tea Room, Bar and Restaurant - delicious. Also, further north, is the dramatic pass of Glencoe. The owners of the apartment, Olga and Tony were extremely helpful and welcoming and we would certainly recommend the apartment as a base for a memorable holiday. Thank you so much for this lovely, thorough review. It was a pleasure to host you and we are so glad you had a good time.